Enjoy a Bay of Islands cruise on the region's only authentic Cream Trip; a 100-year-old tradition of delivering mail and supplies to island residents. Climb aboard a multi-level catamaran and venture out to sea with a knowledgeable crew to inform you along the way. See idyllic bays, Marsden Cross, local homes and natural landmarks like the Hole in the Rock at Cape Brett. Cruising through some 144 islands, be sure to watch out for whales, seals and other marine wildlife. Experience a unique local island by taking a walk or relaxing on the beach and climb in the boom net if you're looking for a thrill. Opt to upgrade your tour with a Bay of Islands dolphin swim (additional $30.00 per person) but be sure to pre-book this as there are limited spaces available. Your one-of-a-kind Bay of Islands cruise departs from the Paihia Wharf and then picks up more passengers about 10 minutes later in Russell — you may hop aboard at either of these locations. On board your jet-powered, multi-level catamaran with both indoor and outdoor seating, cruise through the Bay of Islands — named for its nearly 150 islands — heading toward Cape Brett, the far eastern tip in the bay. Admire great views from the boat's spacious decks while you listen to the crew share information about the region’s history and ecology. Keep your eyes open for marine life like seals, dolphins, whales, penguins and sea birds. Your cruise isn’t just for sightseeing, though — it’s a Cream Trip, a tradition that dates back to the early 1900s when a boat was used to transport cream and other supplies between the islands and the mainland. This means you’ll get up-close views of sandy beaches and island homes as you stop to deliver mail and other supplies to local residents. When you reach Cape Brett, check out its noted landmark, a natural arch known as Hole in the Rock. Then your captain will let you know if the weather and water conditions allow for swimming in an area where dolphins like to hang out (optional, must be pre-booked; own expense). If you’re interested, you can use a provided wetsuit and snorkeling gear. About halfway through the day, stop on a local Island for 1.5 hours of free time to take a scenic walk, go for a swim or relax on the beach. There is a full bar on board as well as tea, coffee and snacks available for purchase (own expense). Limited lunch options are also available but must be pre-ordered at least 24-hours prior to departure. 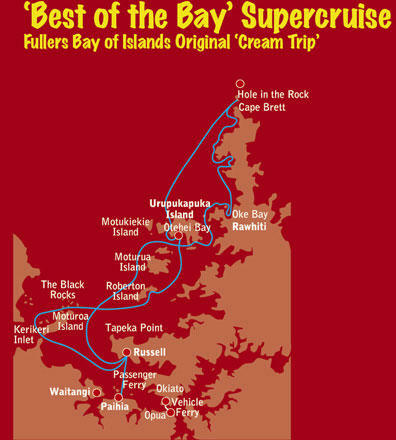 Your cruise ends with return to Russell and Paihia.